Smart Media Alliance | The Smart Media Alliance (SMA) is an industry-led initiative (non-incorporated) fostering research, education and implementation of NFC technology along the customer journey to enhance the consumer experience. 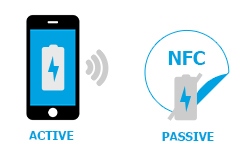 It is a wireless technology that uses the radio field to send and receive various content.There are two components to successful NFC connectivity – the programmed tag and the reader – like an NFC-enabled mobile phone. NFC tags are small, lightweight assemblies that can be attached to just about anything.Each tag combines a tiny computer chip, smaller than a grain of sand, with an antenna that picks up electromagnetic energy beamed at it from the NFC mobile phone. When the tag senses the energy, it identifies itself with a unique number, and the reader can write to it and read its content.